Located between Tampa and Key West ( Gulf Coast) on San Carlos Island / Fort Myers Beach, Florida. Gulf Marine Ways & Supply- one of the busiest boat yards on the Gulf Coast- is an iconic marina with over 40+ years of experience in boat & yacht repairs, restorations, boat maintenance & haul outs for commercial and pleasure boats. This 2.6+- acre, zoned IL,IM,CM boat yard has 3 existing buildings totaling approx 12,242 sqft with work shops, offices and a covered boat barn. Gulf Marine Ways is home to the 150 Ton Travel Lift for hauling vessels up to 130ft+ with all rigging intact. The yard is conveniently located on Matanzas Pass only a 8 min idle to the open Gulf of Mexico. Outstanding proximity to the "big bridge" provides the most convenient deep-water passage for larger vessels making way to and from the Gulf and Bay. This property is located in a high growth residential market area creating a strong future growth potential for this facility, near a very high traffic count location. No fuel tanks on property. Sale includes Land, Buildings & Business. Potential for Restaurant / Tiki Bar. Properties like this in our area rarely come available. Don't miss this unique opportunity. This once in a lifetime opportunity is located directly in the middle of the downtown Fort Myers Beach overlay and some of the last available prime Commercial Gulf front property on Fort Myers Beach. The particular location has extreme high moving traffic as well as walking traffic with exclusive Gulf frontage. Attached to this listing are ideas for multiple uses for this property via the town of Fort Myers Beach. This opportunity has never been available before!! Make your private viewing appointment now!! Located Right next to the new proposed development. Ride on their shirt tales. Any questions regarding zoning please call City Hall. Fort Myers: Truly one of a kind. This is an opportunity for someone to own the the most unique parcel of waterfront property in SW Florida. Over 740' of water frontage, approximately 400' on the Caloosahatchee River and 350'+- of frontage on Whiskey Creek. This ultra prime property consists of almost 1.65 acres. This is an irregular shaped property so dimensions are not accurate. A survey is recommended. New seawall was installed in 2013. Now is your chance to build your private estate. Robalo Drive is located just off McGregor Blvd. Centrally located close to all the amenities in Ft. Myers. Metes And Bounds: Incredible Opportunity to Develop or Build Your Own Private Estate! RARE AND ONE A KIND 4.45 ACRE RIVERFRONT PROPERTY FEATURING 300 FEET OF SHORELINE! Cleared and ready to build! Peaceful and serene, this property features a direct access canal, active palm tree farm, and waterfront views. Enter the property through a stunning gated entrance lined with royal palms. This unique property will make you feel like you’re staying at a private tropical resort with unrivaled views of the Caloosatchee River and direct Gulf access for when you want to get out on the water. Property has been rezoned to RS-1 for development possibilities for up to 12 single family homes. Don’t miss out on this unique opportunity to own one of the last riverfront developmental parcels! Bonita Beach: Rarely available Bonita Beach direct beach front lot. Incredible south end location, this lot offers other rare features including a fully cleared site that is sand end to end with no shrubs. This creates a postcard view effect with beach, gulf, and coconut palms to fill the view. Lot will accommodate a gated, elevated pool home up to 6,000 ac sqft and 10,000 total sqft. Call for details. Bonita Beach: DIRECT BEACHFRONT vacant parcel on the highly-desirable Bonita Beach/Little Hickory Island. Finally, an opportunity to build your dream home with the Gulf of Mexico as the back drop. Enjoy year-round sunsets & the sound of surf from your own piece of paradise, designed to your exact desires. Ideally-positioned to provide a sweeping Gulf view all the way up to Sanibel and down to Naples. Walking distance to several fantastic restaurants & a 10-minute drive to Mercato & the Promenade, with Waterside Shops, Coconut Point, 5th Ave, and the International Airport nearby. Bonita Beach building opportunities are increasingly rare. Newly-constructed homes on Bonita Beach are often 4,000-5,000 sq ft with open floor plans, elevated infinity edge pools, hurricane impact glass with automated screens/shutters & other state-of-the-art finishes & features. Could also be the perfect location for your cozy Olde Florida beach cottage with all the advantages of new construction (hurricane impact glass, concrete block build, etc). Also, an excellent area for vacation rental income for your future home. Listing office available to provide sample photos/floor plans of recently-built Bonita Beach homes. Not Applicable: A rare and unique opportunity to own prime riverfront acreage in Ft Myers. 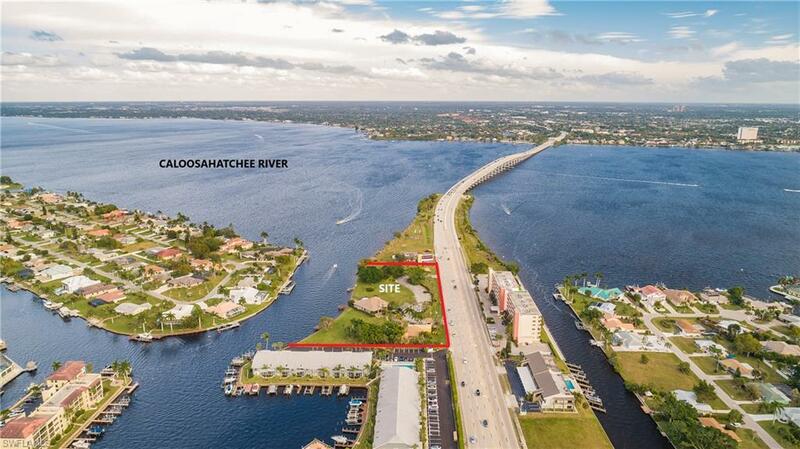 This beautiful piece of property encompasses 200' +/- feet of frontage on the Caloosahatchee River affording amazing sunset views. Known as the Secret Garden, this 3.54 acre is one of the last remaining riverfront properties available with panoramic views of the river. This is an unrivaled opportunity to build a private estate off the coveted McGregor Blvd. area. There is an existing eagle nest close to the edge of the river making this piece of property truly amazing! Bonita Beach: This is a rare opportunity to own an exclusive island property, located in the estuary of Estero Bay. Originally settled by the native Calusa Indians who reigned Southwest Florida, this historic 9-acre treasure is now available for the first time ever. Whether it is your private island secluded residence, development opportunity, university archeological site or resort experience, you will see the historical value of the island and be able to share such a rare gem with future generations. Arrive to your boat-access property from nearby Lovers Key State Park to the 50-foot dock, and stroll through the boardwalk where you will enjoy native plantings and wildlife. As you wander the property to inspect the multiple building sites, you can easily be distracted by the artifacts that will you send you back to the 1500s. Enjoy a location that provides easy boat access to the island property and all amenities. This land will transform your mindset to peaceful tranquility and allow you to connect with history that is hundreds of years old.